The 32nd annual Georgia Peanut Tour kicked off with a Hot Topics seminar on Tuesday, Sept. 18 at Crosswinds Golf Club in Savannah, Georgia. The seminar provides an update on the 2018 peanut crop as well as an update on the farm bill and other legislative activities that can have an impact on the peanut industry. Each year the seminar also highlights some of the latest hot topics happening in the industry and this year’s special focus included international activities of peanuts. 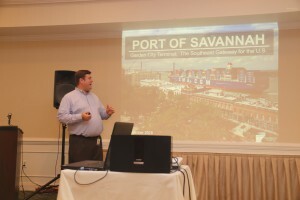 The speakers provided an overview of the USAID Peanut Innovation Lab, economics relating to the import and export market within the peanut industry, research activities around the world and an overview of the port in Savannah. Click on the links below to view the speaker presentations.